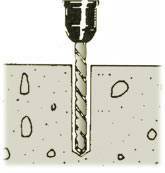 Drill a hole in the base material with a hammer drill and a correctly sized carbide drill bit for the diameter anchor you are using. The diameter of the anchor is equal to the hole diameter. Clean out the hole of all debris. 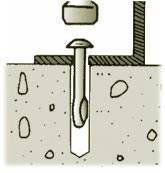 Insert the anchor into the hole through the item being fastened, then strike with a hammer to set.